my sweet friend Christie made the this awesome Christmas gift for me. The jars are quart Ball canning jars. 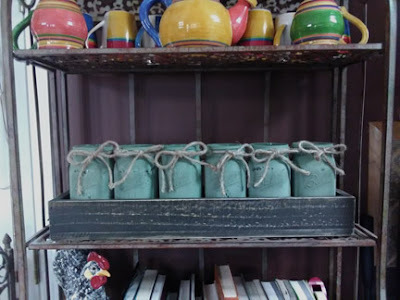 She painted them with chalk paint and tied them with jute bows. 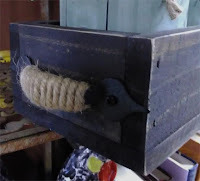 She built the cutest little wooden container for them. They fit into it perfectly. It has handles that match the jute bows. So cute! The container just fits on my baker's rack in the kitchen. 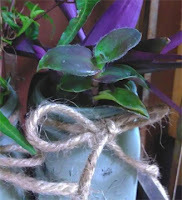 I had ivy and Wandering Jew in the greenhouse that I was rooting for spring. There was no more space for the cuttings in the greenhouse. 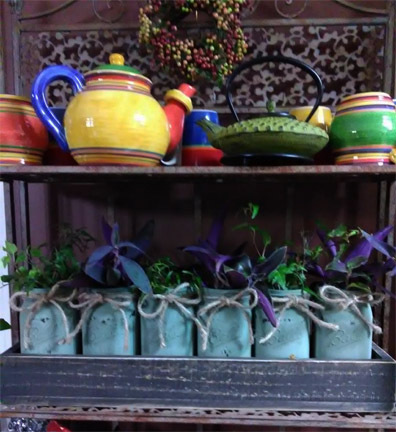 The jars were the perfect size for rooting those plants. Now I can enjoy watching them grow without having to check the greenhouse to be sure they still have water. Besides, they are a cheerful addition to my room! I think there is enough light for the cuttings to be happy but I may purchase a little florescent tube to go under the shelf above the plants. It would highlight the jars too.